Years of dreaming and planning are drawing to an exciting close. This should be my last pre-hike post; soon I’ll be hiking more and talking less. This week was all about some key final details. So close! I’m almost complete with pre-hike planning. Sure, no plan survives first contact with the enemy but you have to start somewhere. For this post I’ve focused on transportation to the trail and some specific plans to get through the Great Smoky Mountains NP. Once north of the Smokies we should have established our trail legs and become accustomed to our new routine. Then the plan should morph into a lifestyle. Traveling with a non-service animal limits public transportation choices. With no bus, train, or plane options I’ll travel from Duluth, Minn., to Kennesaw, Ga., via rental car. Once there I’ll meet a friend who has generously offered to shuttle us to Amicalola Falls SP the next day. Pre-trail magic comes through. Once again, having Dixie requires a bit more specific planning than I would have done otherwise. Without her I’d forgo mail drops and simply resupply on the trail. I know there is a lot of human fare but I’m less sure about quality dog food. I want to keep her diet as constant as possible. Therefore I’m sending mail drops of food, canine and human, to the Top of Georgia Hiking Center, at mile 69, and to Loving Care Kennels in Pigeon Forge, Tenn. These drops will get us to and through the Smoky Mountains. After that I’ll coordinate with my son Nick as to when and where to send additional drops. By then I’ll also have a more accurate sense of our pace and food requirements. My son Nick lending a hand with mail drops. Our trip is first and foremost a camping trip. While happy to spend most nights in a tent I do intend on making occasional hostel or hotel stops. These stays will provide a chance to clean up, dry out, and enjoy the comforts of a bed and four walls. In addition, Dixie needs lodging for the roughly 70-mile Great Smoky Mountains section where dogs are prohibited. 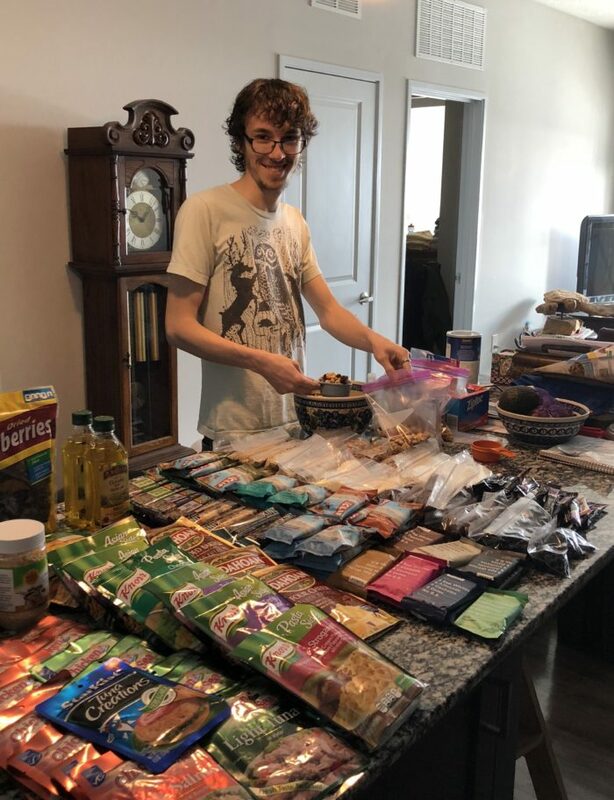 Similar to my resupply approach I’ve made some specific initial plans and will transition to a more general self-sustained hike. I studied The A.T. Guide for dog-related information. Top of Georgia has only four spaces for hikers with dogs so I made a reservation instead of taking my chances. I also made reservations for Dixie at the Loving Care Kennel. They will pick her up at Fontana Dam, kennel her, and then shuttle her to the north end of the park to meet me. I didn’t make any additional reservations beyond the Smokies but I highlighted all the pet-friendly establishments so I can easily review my options on the trail. There is a developing theme here: start specific and then let the trail reveal itself and adjust. I have nothing against pre-hike posts but I’m glad I won’t be writing anymore of them. My true desire is to capture and share my observations of the trail and trail life. While doing so I’ll undoubtedly write elements of a how-to guide but I prefer to focus on the discovery or experiential side of this journey. What will I discover? I don’t know; I suppose that’s the point. I do know I can’t wait to meet my fellow hikers and see what’s out there. I’m thrilled for anyone to come along via this blog or other media. How about a list of your gear you started with? What pack, boots, tent, hiking poles…? I teared up when I read about your wife.im sorry for your loss of your wife. I hope you can find a new hope and new dreams on the trail,I’m for sure your wife will be right there with you . Good luck on your new Journey in life . Hikinghillisat2019.